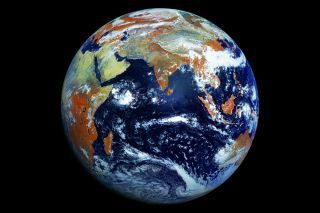 An image of the Earth taken by the Russian weather satellite Elektro-L No.1. The transition from June to July will be delayed by circumstances beyond everyone's control. Time will stand still for one second on Saturday evening (June 30) because a "leap second" will be added to let a lagging Earth catch up to super-accurate clocks. International Atomic Time is a very accurate and stable time scale. It is a weighted average of the time kept by about 200 atomic clocks in over 50 national laboratories worldwide. Atomic time is measured through vibrations of atoms in a metal isotope that resembles mercury and can keep time to within a tenth of a billionth of a second per day. The result is extremely accurate time that can be used to improve synchronization in precision navigation and positioning systems, telecommunications networks and deep-space communications. But from their careful observations of the positions of the stars, astronomers have deduced that Earth's rotation is ever so slightly slowing down at a non-uniform rate, probably attributable to its sloshing molten core, the rolling of the oceans, the melting of polar ice and the effects of solar and lunar gravity. Today's atomic clocks are accurate to approximately one second in 200 million years. On average, our planet has been falling behind atomic time at a rate of about two milliseconds per day. As a result, it now trails the "official" clock by about six-tenths of a second. As a result of this difference, atomic clocks, which are used to set all other clocks, can get out of sync with the Earth and periodically have to be adjusted. A leap second has to be added from time to time to make up the difference. The next time will be Saturday, when the master clock at the United States Naval Observatory will be adjusted at 7:59:60 p.m. Eastern Daylight Time, or 23:59:60 Coordinated Universal Time (UTC). This will put Mother Earth about four-tenths of a second ahead of the clock, giving her a bit of a head start as we transition into the new month of July. If you don't have a radio clock, you can bring up a time display on your computer by going to: http://nist.time.gov/. You can also listen for the leap second by tuning in to a shortwave time signal station. In North America, the "extra tick" can be heard by listening to either station WWV in Fort Collins, Colo., at 2.5, 5, 10, 15 and 20 megahertz; WWVH in Kekaha, Hawaii, at 2.5, 5, 10 and 15 megahertz; or CHU in Ottawa, Ontario, Canada, at 3330, 7850, and 14670 kilohertz. A listing of shortwave time signal stations for other parts of the world can be found at http://www.dxinfocentre.com/time.htm. Saturday will be the 25th time a leap second has been needed since the practice was initiated in 1972, and will be the first in 3½ years. The most recent leap second was inserted into the atomic time scale on New Year's Eve of 2008. Incidentally, July 1 is not the midpoint of 2012. That will take place July 2 at 0 hours UTC if you count the year as beginning when it did at Greenwich, England – or at 1 a.m. Daylight Saving Time, if you count the year as beginning when your clock said midnight in the standard time of your time zone, . Regardless of how you use your extra second, just keep this one indisputable fact in mind: Whenever you note the time on the clock, realize that it is now – right now – later than it has ever been.